I don’t even have to explain the hype behind sparker exits. I mean, c’mon. LOOK AT THEM. It looks (and feels) like pure magic, hand-in-hand with the love of your life, walking out and being surrounded by so many people that love and care about you. It’s the perfect way to end one of the best days of your life. BUT, before your grand exit, there are a few things you need to know about pulling off the perfect sparkler exit after your wedding. First thing’s first, Check with your venue. Some venue’s have a no-sparklers policy, so make SURE to double check with them that they are okay with you doing sparklers as your exit! If you have hired a day of coordinator or wedding planner, this is your chance to utilize them! Managing big groups of excited (and let’s be honest, drunk) people is a task in itself. While your photographer can totally help, their main focus needs to be creating gorgeous photos out of your exit, not coordinating and directing it! Communicate with your planner or coordinator during your planning phase to make sure you have a plan in place for your exit and that they will be there to assist! If there is any one factor that I see that contributes in sparkler exits not going as planned, it’s that there are never enough lighters to go around. Make sure you have at least 8-10 lighters evenly distributed throughout the group! (I know it sounds excessive, but trust me.) I suggest starting them at both ends of the line and letting them pass the lighters in towards the middle. TELL GUESTS TO Light your sparkler with THE PERSON beside THEM, NOT ACROSS THE MIDDLE. The second biggest issue I see during sparklers exits is people walking across the middle of the aisle (if you are doing the sparkler tunnel) to try to find someone to help them get their sparkler lit. This is usually due to not enough lighters. The reason this is a problem is because half of the line’s sparklers will be lit, so the couple begins to run out while there are still people in the middle trying to get their sparkler lit, hindering your photographer from being able to get a clear shot of the couple making their grand exit. Tell your coordinator or planner to make sure to let your guests know that they should be lighting their sparklers with their neighbor, the person standing beside them, not across the middle! 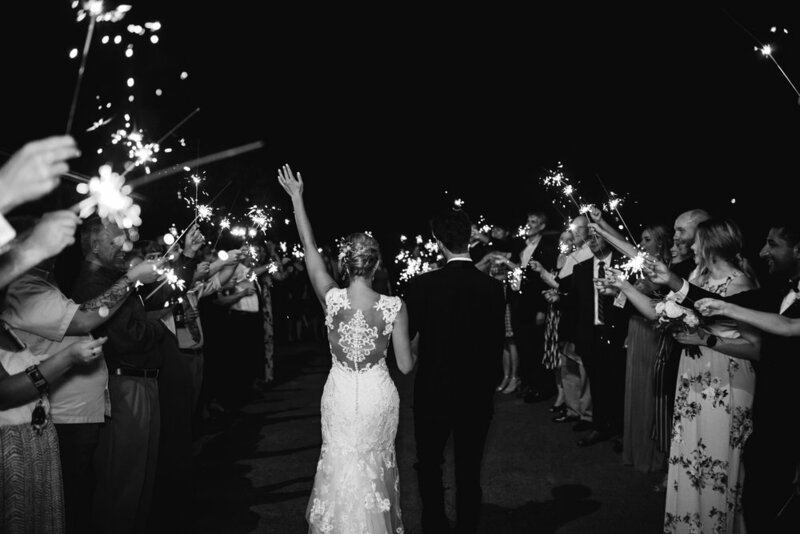 I always see the traditional sparkler tunnel and that is super fun, but it’s not the only way to do a sparkler exit! What we did for our wedding (and a few other wedding’s we’ve photographed) is have your guest stand in a semi-circle (kinda like a crescent moon shape) and let our couple dance in front of them! It’s much less rushed and makes for fantastic photos! This gives your photographer (hi! it me) time to get tons of great photos of you during your sparkler exit. I’ve seen way too often guests just dropping sparklers on the ground (YIKES!! Fire hazard!) or even worse, dropping them all into a pile. Which doesn’t sound that bad at first, right? Well when grouped together, sparklers can combust and although it hasn’t happened at a wedding I’ve been at, I’ve heard plenty of horror stories of people piling them together, combusting, and ending up severely burned by them. Don’t end your perfect wedding night with a trip to the ER! Make sure there is a place to safely dispose of sparklers and make sure your planner/coordinator explains the game plan before everyone starts lighting them. The biggest tip I have for your sparkler exit is ENJOY IT! Sparklers are such a fun exit and the more you take in that moment and enjoy it with your new spouse the more that will show through in your photos! Check out a few of our other posts below for other tips for your wedding day!